For bloggers and webmasters, the uptime or availability of the websites or blogs is of utmost importance. To ensure that the website is always up and running, administrator should continuously monitor the status of the website and web server or web host. It’s impossible to sit in front the computer to check the status though, so most people resorts to web-based free web site monitoring services or tools such as URL Guard and Tiny Site Watcher. Pingdom is a web-based service that tracks the uptime, downtime, and performance of websites. What set Pingdom apart from other website monitoring service is that it’s an established and reliable monitoring service which gives accurate status. In addition, Pingdom monitors websites from multiple locations globally so that it can distinguish genuine downtime from routing and access problems. Send alert instantly via email, SMS, Twitter or iPhone when website is down. Provides external monitoring from Internet to ensure that website is reachable and responding well. Track uptime, downtime and performance. Uptime, response time and performance reports. Error analysis to help troubleshooting. Monitor websites, SMTP, POP3 or IMAP mail servers, DNS servers, FTP servers, networks, TCP or UDP port, and much more. Support repeat notification on preset number of down cycles. Support checking for specific string or text on web page. Support user name and password credential login, or POST data. Support changing of request user-agent. Pingdom has never offered free account, until now. Previously, the only free service provided by Pingdom is Pingdom GIGRIB, a distributed website monitoring service. 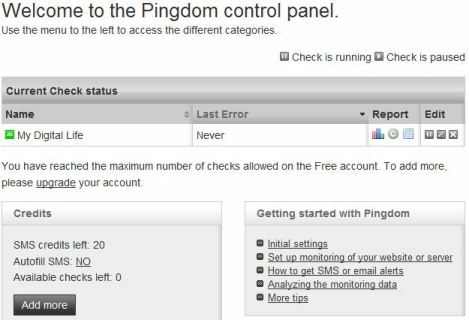 But now Pingdom also offers free account that lets user monitors one website (or any other one check). Best of all, the free account includes 20 SMS (text message) alerts, which seldom provided by free website monitoring service as each SMS has cost. With free SMS, user no longer need to use email to SMS gateway. Pingdom can suppress notification alerts until further checks confirm that downtime is indeed occurred before sending out alerts. The feature tremendously save the number of SMS credits required in event of slow server or spike network traffic. However, do note the free 20 SMS is one-time gift, and it’s not recurring nor replenished every month. The email and Twitter alerts is always free and unlimited though. In addition, the free account also supports 1 minute checking and probing interval, effectively making the monitoring and fault alert real-time. The Pingdom free account is not trial account of paid or subscription-based service plan. The free account will last forever and always free, provided user logs in once every 90 days to Pingdom account. Register and sign up for Pingdom free account at https://www.pingdom.com/signup/free/. Each person is only entitled one account (free or paid) on Pingdom according to ToS (Terms and Conditions).